Leather is one of the most beautiful materials in existence. It’s durable, soft, attractive, and costly. Fortunately, bonded leather offers many of the qualities of genuine leather at a lower cost. 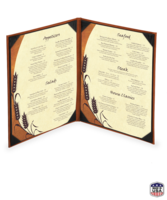 Bonded leather menu covers give your customers the appearance of upscale leather at a price that fits your restaurant’s budget. Bonded leather menu covers are composed of reconstituted leather, which is a man-made material that consists of a pulp made from shredded leather, a fiber or paper backer, and a polyurethane coating. The bonded leather material and supportive fiber backing is expertly sealed to a stiff cardboard base and an optional foam padding insert to create the menu cover. 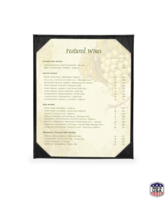 Additionally, our bonded leather menu covers are coated with a thin layer of clear polyurethane laminate to provide a protective shield against dirt and grease. Bonded leather menu covers offer many of the qualities of genuine leather. They are sleek, attractive, and a classic choice for many restaurants. Additionally, they are fully customizable. Any feature that you want your bonded leather menu covers to have, from the color to the inscription on the front, is entirely up to you. For easy use, your menu sheets can be quickly removed and replaced with the corner tabs made of imitation leather. Any restaurant that wants to deliver a high class experience with leather should invest in bonded leather menu covers. They provide the style and functionality of leather at a lower cost. 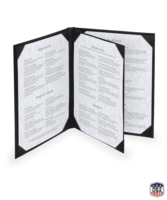 Bonded leather menu covers add a touch of class to the atmosphere of any nice restaurant. Due to their high-quality build and polyurethane sealing, bonded leather menu covers are highly durable. Food, liquids, and frequent handling will do little to harm them. Bonded leather menu covers last for at least five years. Each of menu covers can be quickly washed with a damp cloth and a small amount of dishwashing liquid only if necessary. Once cleaned, your menu covers should be quickly dried for best results. There’s no need to worry about the heavy maintenance of keeping leather skin from drying out and cracking with bonded leather. 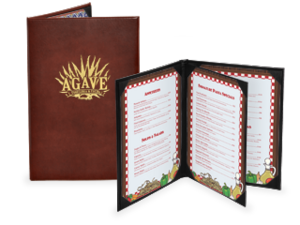 We adapt the size of our bonded leather menu covers to suit your restaurant's unique needs. Unlimited sizes are available as well as up to six-view booklet-style designs. There is no lack of colors to choose from for your bonded leather menu covers. In addition to black and white, our bonded leather menu covers are available in a rainbow of colors, including bolder hues like green, blue, and red. Midrange to high class. Despite the fact that they are made of high quality reconstituted leather, we still offer you bonded leather menu covers at a moderate price. 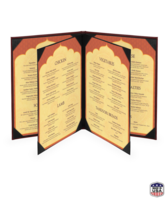 Bonded leather menu covers will add instant value to your dining experience. Your restaurant can present a high class image by giving patrons the atmosphere that they want, all at a moderate cost to you. A less expensive version of the genuine leather menu covers, the bonded leather menu cover gives you the look and feel of luxury without the cost.